Sing in the vein to the Christmas song… but that is how EXCITED I am this time of year…Halloween!! I wait ALL year long for this day! Normally people plan all year long for their costume (don’t they??) , building their costume weeks ahead of time… except, as much as I love it. I never can narrow down my ideas, so I end up building my costume in 2-3 days before. Yes, this was built in 2 days before our Halloween Parties. We are a Silent Pictures actual theater and silent film. We built this contraption in just two days!! Yes, two days. Whew… I am beat. We are an actual working Silent Pictures theater! I am on a 1920’s crazy fix lately. I loved everything about it; from clothing, the decor, and the excitement of so many new cultural events, one of which was Silent Pictures. Can anyone say Norma Descend ? Sunset Blvd the movie is one of my favorites because of how Norma describes how life was before the “talkies”… it was all expressive, she always had me at “ We did not need to talk, we had faces!” So I have always had an infinity for those actors of that time. With my costumes, my motto is go big or go home. If I can fit through doors, I did not try hard enough creatively. I so wish you could see this in person, pictures do not do it justice, due to the lights/flashes in cameras. The costume is made by my boyfriend and I, my creativeness takes ahold of me and there is not relaxing till we got it! We have an mini, actual film projector on the platform behind the dialogue “GASP!” That projected old black and white, film grain upon us, like old silent movies, so it ran continuously on to us. We even have silent movie music playing. We are actually in a box we built by 1”x2” wood, too big for door ways. so we added wheels on the bottom of our box, so we can slant it down to fit. So we can fit in our van and be transportable, the flap with the projector is hinged so we may fold it to travel to the parties. The sides and front are fabric and my handy go-to for everything in life… the ol’ mighty glue gun! I decorated the front (and the back has and entrance sign, not pictured. Our biggest obstacle besides a movie projector, was the back drop, we were initially going to have one printed up that big, but the price was very expensive. So I happen to find vinyl, scary wall paper type of thing, but the it was only half the size of what we needed. so we needed to cut/add and match exactly (not as easy as one would think.) We glued, stapled, hammered everything. You can not see, but I have popcorn and popcorn boxes all over the where the projector like it was a movie theatre floor (glue gunned down of course.) I found those arms and thought… there is my villain, I stuffed them to make them more realistic, added sticks to them to make them move a little, then attached them spookily inside our box! Wanted to make like it was coming at me. I added a creepy birdcage (found it broken in a thrift store (glued it back together), found some fake birds (adhere on on the boyfriend and one hanging, added for total creepy castle-feel effect. The biggest feat was also our make up, which was going to half the battle. and I am no make up artist. We had to assimilate as if we were not just black and white but emphasis the expressiveness. Made of blacks, whites and most gray scale. Spray painted our hair jet black. I made the head piece myself for me, and then created outfits of what we already had in our closets, made his tie though, needed a 1920’s villain style. 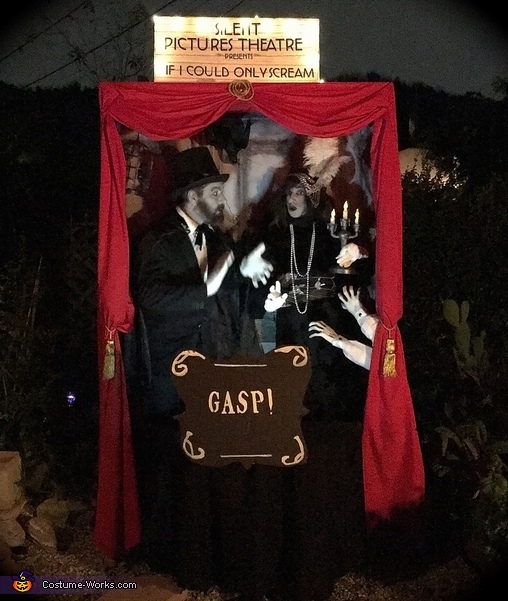 Our marquee sign I created; cut, copy, glue, added lights, as with the “GASP “ sign, the marquee has actual blinking lights on both front and back. My boyfriend made that removable so we may get it into our van. My candelabra actually lights up (hard to see) so I painted it to give the effect of being black and white, over a glowing fake candle (another feat I thought would be simple, not so much.) I was shooting for a the 1925 spook vibe similar to “Phantom of the Opera”, starring the ever so spook Lon Chaney. The response was insane and pure delight by everyone. WE did not leave the box ever, we wheeled that sucker all over Los Angeles, all evening long, nor ever broke out of our characters. Actually we could not even smile, because it would lose the effect due to teeth, now let me tell ya, that is hard when everyone else is laughing. Everyone went nuts, our first party is one of LA’s biggest Masquerade Balls, yes, we dragged that up numerous flights of stairs, into a historic ball room with numerous floors, yes, we even danced in it, ordered drinks at the bar…always inside the box!! A switch for us outside box thinkers. The public loved it so much, we acted out different scenes together, so mostly everyone video taped us. Our second event was LA’s biggest party West Hollywood Carnival in the streets with 500, 000 people. The reaction was over the moon, last year we went over the top as well, and could not move too far along the party that was numerous blocks long, so this year the response was just the same. Even LAPD kindly and laughing had to ask us to move off the main closed street, because too many people were blocking the carnival flow by trying to take pics of us and with us- they were surrounding us and blocked the flow, and they said it was a safety hazard, it was hilarious and a blast! And surely the people followed us every where we went! We just loved doing this, I heard people/strangers saying what a great team we were together, just observing us doing our over acting and our commitment to Halloween, that was actually my favorite compliment about us being a team. I still can not believe we whipped this out in two days, I seem to work better under pressure and actually usually have at least 3 great idea costumes and can not narrow it down before Halloween, yes, I am indecisive, but once the pressure of two days away, it jump starts my decision. SO I definitely work better with the rush and more creatively. I finally got to feel like my Silent Movie spirit animal… Norma Desmond, and yes, we were SO ready for our close up! !